Kappler® Zytron® Z300 Coverall with Hood & Sock Boots with Boot Flaps and Elastic Wrists- CE Certified Type 3.Kappler® Zytron® Z300 Coverall with Hood & Sock Boots with Boot Flaps and Elastic Wrists- CE Certified Type 3.Zytron 300 is ideal for demanding applications where there is potential for chemical splash. Increased physical strength and even broader chemical holdout take the protection level up a serious notch. 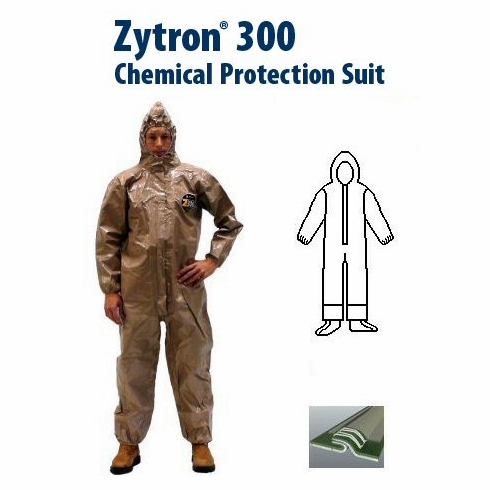 Home | Personal Protective Apparel / Workwear | Kappler Chemical Protective Apparel | Kappler Un-Encapsulated Chemical Suit | Kappler® Zytron® Z300 | Kappler Zytron Z300 Coverall with Hood & Sock Boots with Boot Flaps and Elastic Wrists- CE Certified Type 3. Kappler® Zytron® Z300 Coverall with Hood & Sock Boots with Boot Flaps and Elastic Wrists- CE Certified Type 3.